Give us your tired, your poor, your searching for tax help. She was waving to cars outside the fly by night tax preparers office when the zombie apocalypse happened. Now she is a ugly flesh eating costumed zombie beckoning you to come near. Find her in the Creatures Section of the Victory Store. 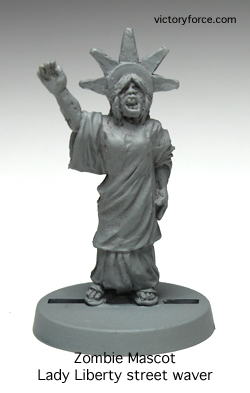 This entry was posted in Spotlight and tagged miniatures, spotlight, zombies. Bookmark the permalink.